Presently, lowering readmissions for high-risk patients is an essential process for hospitals. Healthcare Financial Management Association’s article “Two Ways Hospitals Can Reduce Avoidable Readmissions” records that successful initiatives from 4 hospitals with reduced 30-day rehospitalization rates are to a certain extent due to collaborating with inpatient and outpatient care providers such as Hired Hands Homecare, a top home care company in Santa Rosa, CA to supply a continuum of care. Begin preparing for a patient’s discharge on the admission day. 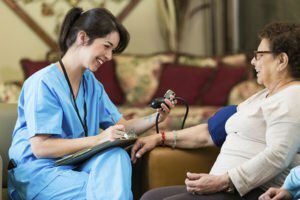 When an older adult is admitted to the hospital, contact a home care agency, like Hired Hands Homecare, to arrange for in-home care when the patient is discharged. Outcomes are better when services are made available as soon as possible. Make use of technology to evaluate, monitor, or refer patients. Perform a comprehensive appraisal of the patient’s risk factors, care needs, obtainable resources, knowledge of the disease or condition, and degree of family support. Lowering fall risks in the home by providing a safety evaluation of the home, assistance with ambulation and bathing, etc. Keep your senior loved ones safe and well and avoid hospital readmissions with a little help from Hired Hands Homecare!